Systematic review of medical research papers can lead to new knowledge and treatments of diseases. The existing software tools however, are very limited and often a lot of manual work is involved. Stephen Gilbert of Iowa State University uses artificial intelligence and machine learning to automate the process of systematic review. 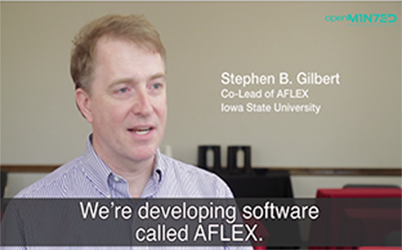 “We’re developing software called AFLEX. So imagine that somebody asked you: “I need to know everything there is to know about cancer research with infants.” If you want to know the answer to that question, you have to do a systematic review. This is a special kind of research review in which you start with thousands of articles that you might find from a simple search query, and you narrow them down systematically to make sure that each article is high quality, and you eventually narrow down to perhaps a hundred articles. And you do statistics on those to come up with: What are the results? What do we really know about this topic? And you can imagine that’s a very difficult process if we start with thousands of papers; I obviously need software tools to help me narrow that down; I can’t do it manually. So currently in the systematic review world there are some software tools but they aren’t enough. I can do basic filtering and keyword search, but if I want to know whether articles have a randomized control trial or whether they use blinded assignment of their participants and treatments, that’s a manual process; we need humans who are trained to do that. Well in our software we’re trying to use artificial intelligence and machine learning to automate that. So our software could automatically read the article, and say “Yes, this article uses a randomized control trial; it has a one arm design of its study…,” and all of these things we need to know to make sure it’s a high quality study. You know there are systematic reviews on other topics like software design or even the business world sometimes they do it, but medical—I think it’s really a life and death issue. We are just starting with this software; we have trained it using about 500 articles that we’ve manually labeled and tagged up, so we said these are 500 excellent articles, here’s all the queues and features of those articles that tell us what sort of experiment this is, and using that, we hope the machine learning can learn to identify all those features of new articles.